This post is a wee reminder to folks that I am a wee bit deaf. By which I mean, of course, profoundly deaf in my right ear and moderately deaf in the left. Most of the time as an oil painter this is not a problem, indeed can count as a blessing - I don't notice traffic noise and people in other studios being very loud doesn't bother me. When I have someone modelling for me there is little background noise and I can lip read easily so again it doesn't tend to be an issue. Also I rely on body language much more than most, which must help in portraiture. Openings and (even worse) dinners are another matter. To recap a little, I have mainly a conductive deafness that I have had since being a toddler. This is different from most peoples deafness - which tends to be sensorineural, comes on much later in life and mainly affects higher pitched noises. 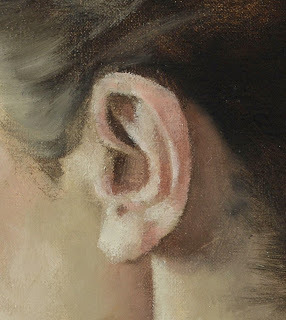 Because I lost most of my hearing on one side when I was very young I find wearing my hearing aid difficult - I am so used to sound coming from the left that I find hearing stuff on the right disorienting. Unfortunately the sound I do get from the aid is not actually enough to understand speech - just enough to be aware that someone is speaking. It also tends to rub, leading to infections. Bah. However, at openings I do try and remember to wear it, because it does seem to be common for people to start talking to you before you can see them and without the aid I am quite likely to entirely unaware that someone is speaking to me. I'm sure I've probably lost many potential friends over the years through perceived rudeness. But if I cannot see your face directly I am unlikely to be able to hear you. Background noise makes life more difficult as well. If we are in a crowded, noisy space and you are trying to tell me someone's name, especially an unusual one, forget it - what noises I can hear and lip read relatively easy are vowels - consonants are much harder to distinguish. This is one reason I often have a notebook with me and may ask you to write a name or word down - this is much quicker, often, so please be patient. What else? Dinners - urgh! If you are on my right hand side, you'll notice that I virtually turn round in my seat to talk to you, as I try and get the good ear closer. But this is tiring so I may well end up just talking to the person on my left - much easier. As for those across the table, no way. Just too far away. Which means, of course, that generally at dinner parties I talk to one person all night. Great when it is my husband, but then, why be at a dinner at all? Towards the end of the night I'll often be tired and prefer to talk to long term friends - this is easier for me as making sense out of the noises I hear is simpler and less exhausting when I am familiar with their turns of speech and body language. So please don't be offended if I don't want to party the night away - maybe next time. If you are at all interested in reading more (and do remember my kind of hearing loss is unusual, if you know someone bit deaf, the best thing is to ask them what is best for them.) then the Action on Hearing Loss website is generally useful with lots of information on how to communicate, different types of hearing loss and so on - there is even a test to see if you need a hearing aid yourself. If you know any other good webpages, bloggers etc on the subject, please let me know. Everything you have said is ,oh, so familiar to me, all the problems and the perceived rudeness and 'stupidity', the need to see a persons' face to hear what is being said, the isolation of being unable to participate, etc., etc. Deafness is difficult, and like you I know nothing else, but there are worse things. The funniest thing, if you tell folk, is that they then SHOUT, which is really no help! Nice to hear from you, Sharon and so agree there are worse things. However, I do have joint problems as well but think that the deafness has affected my life uch more - pain and lack of mobility is annoying, but difficulty communicated is worse. But maybe I just want to talk too much!